London post production company Rushes has produced a Christmas video for their clients, featuring a young deer (reindeer?) out for a night in the city. Being in the possession of a red nose can be a dangerous thing for a reindeer. It’s a good thing Rushes security is a little lax. 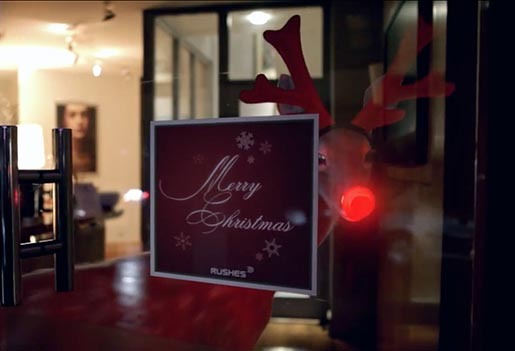 The Christmas Deer spot produced at Rushes by directors Martin Goodwin and Andy Nicholas, senior executive producer Norra Abdul Rahim, CG team Craig Travis, Chris Hutchison, Andy Hargreaves, Liam Hoflay, David Drese, nuke artists Noel Harmes, Eleanor Rogers and Sarah Breakwell, Flame artists Martin Goodwin, Richie White, Glenn Cone, Andy Barnard, and colourist Simone Grattarola. The film is designed to showcase the creativity and versatility of the Rushes VFX team as shoot supervisors as well as technicians – available to help you with their clients’ projects. The film required Rushes to composite the CG deer character into a variety of lighting conditions, both day and night, interior and exterior. Some shots like the opening scene use very natural lighting whilst others needed interactive lighting from streetlights, shots and signs. The project was achieved entirely within Maya, and used Nuke and Flame to composite the scenes and apply the final polish to the film. Craig Travis, lead animator, said “It was a great chance to bring the deer character to life by observing the subtleties of animal behaviour. We wanted to add subtle humour to its performance without compromising reality”.